January 02, 2019 by John T. Keith, J.D. 2. When will our donors perceive the effect of this change on their own charitable giving? Those select few of your donors who are the most engaged in the details of their own tax planning will likely have tracked the tax law changes as they developed and may have already decided whether to change aspects of their planning during 2018. Many other donors may not notice the effect of these changes until they file their tax returns for 2018 during the spring of 2019. For this reason, the full effect of the tax changes upon charitable giving will be best evaluated in 2020. 3. For those donors who lose the option of claiming an itemized charitable deduction, what might they and their tax advisors consider as an alternative? Donors may decide to bundle gifts intended for multiple years into a single year gift for tax purposes. For example, instead of giving $2,000 for three years in a row, a donor might decide to give the full $6,000 in one year and $0 in years two and three if that will help her to reach the new threshold for claiming an itemized deduction in year one. Additionally, a donor might choose to accomplish this bundling through the use of a donor advised fund. A donor could bundle multiple years of giving into his donor advised fund in a single year and then continue to support various charitable causes through his regular pattern of annual giving via distributions from the donor advised fund. 4. What effect might these tax law changes have on our most wealthy donors? The estate tax law has also changed significantly. Prior to the tax law change, the federal estate tax applied only to those who passed away with an estate valued at more than $5.49 million (or estates greater than $10.98 million for married couples with appropriate tax planning). After the tax law change, the federal estate tax now has doubled such that it only applies to individuals who pass away in 2018 with more than $11.18 million (or $22.36 million for married couples who have planned appropriately). To the extent that your top donors might have tied their charitable bequest dollar amount specifically to the avoidance of estate tax, this change may affect their plans. Keep in mid however, that high net worth donors have consistently ranked tax avoidance as a lower priority than their belief in the missions of their favorite organizations and their desire for specific impact upon the world through their philanthropic investments. Their belief in your work remains the same. The method of their support may change. 5. Are these changes permanent? The changes made for individual taxpayers will expire on December 31, 2025. Unless additional tax law changes are passed by Congress and signed by the president, all of the changes discussed above will end on that date and the tax law will revert to the rules that were in place in 2017. As we approach 2025, this planning uncertainty may begin to affect some donors who are considering multi-year pledges and planned giving (for those who may be concerned about the estate tax), especially in the context of fundraising campaigns. We are advising clients to take a good look at trends in their 2018 fundraising results and use these to identify areas where they might see additional impact in 2019 and beyond. 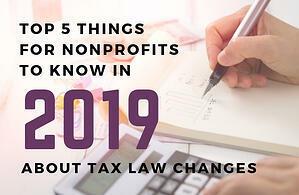 Train and encourage your staff to have conversations with donors about their 2019 plans in light of these tax law changes.